Tim Mahoney executive vice president and chief product and marketing officer for Volkswagen of America discusses Volkswagen's U.S. goal of selling 800,000 per year by 2018 along with diesel, hybrids and commercials. VW is launching a TV commercial Labor Day weekend where a dog swallows a key fob so must be in proximity of the vehicle for his owner to operate it and to drive him to the vet - very creative and funny - good job Tim & agency Deutsche, Inc.
Mahoney reports directly to Jonathan Browning, president and CEO of Volkswagen Group of America and president of the Volkswagen brand. Mahoney is responsible for the strategic alignment of the brand’s product planning and marketing efforts in the U.S. He assumed this role in May 2011. Prior to joining Volkswagen, Mahoney was senior vice president and chief marketing officer for Subaru of America for five years. Prior to that he spent seven years with Porsche Cars North America where he held the positions of general manager of marketing and, later, vice president of marketing. Mahoney joined Subaru of America in 1984 as a marketing research analyst, and was promoted through the organization holding a number of management roles until going to Porsche in 1999. The BMW Zagato Roadster debuts three months after the premiere of the BMW Zagato Coupé, a collaboration between BMW and Italian coach builder Zagato, founded in 1919 by Ugo Zagato who learned his trade in aviation, where aerodynamics and lightweight construction play a central role. Zagato became a body construction partner to Alfa Romeo and today, Andrea Zagato and Marella Rivolta-Zagato are the third generation running the company which describes itself as a design studio combining the emotion and hand-craftsmanship of body construction with the precision of state-of-the-art technology. Because this is a piece of art, there were no performance specs to be found but being a BMW one can only expect that this could be the ultimate of ultimate driving machines. The new 2013 Subaru XV Crosstrek compact crossover, on the Impreza platform, has the standard Symmetrical All-Wheel Drive powered by a 148-horsepower 2.0-liter BOXER engine mated to a five-speed manual transmission or available second-generation Lineartronic® Continuously Variable Transmission (CVT) with fuel economy figures of 25 mpg city / 33 mpg highway / 28 mpg combined. The new 2013 Subaru XV Crosstrek, introduced at the New York Auto Show in April, will have two versions, the Premium and the Limited model with additional luxury and technology. 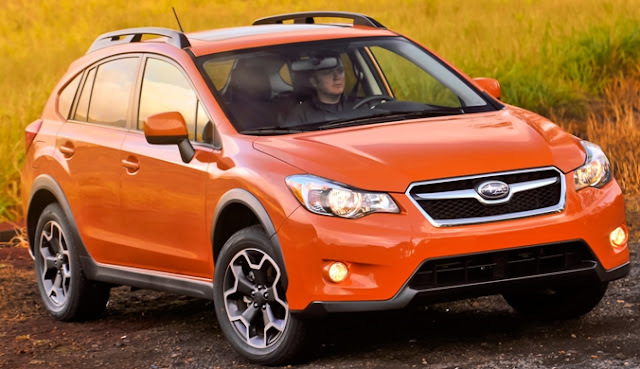 The Subaru XV Crosstrek uses standard 17-inch alloy wheels with 225/55 R17 all-season tires,a four-wheel disc brake system featuring large front rotors, a 15.9-gallon fuel tank on a 103.7-inch wheelbase with rear seat legroom of 35.4 inches. With the standard 60/40 split rear seatbacks folded into a completely flat load floor, there's up to 51.9 cubic feet of carrying space. The new 2013 Subaru XV Crosstrek hits showrooms in the next few weeks so we expect pricing any day. Stay tuned. The Infiniti Emerg-e Concept is the 402-horsepower mid-engined, twin electric motor-powered Infiniti capable of accelerating from 0 – 60 miles per hour in just 4.0 seconds and from zero to 130 miles per hour in a 30-second burst which operates as a zero-emission urban transport over a 30-mile range. The new 2013 Fiat 500 Turbo with sport-tuned suspension and exhaust and a 135-horsepower 1.4-liter MultiAir® Turbo engine arrives at FIAT Studios nationwide this Fall with an MSRP of $20,200 including the $700 destination charge. The front fascia was pushed 2.7 inches forward to accommodate the new 1.4-liter MultiAir Turbo engine and a liftgate-mounted spoiler extends the roofline to improve aerodynamic behavior. Inside, the new Fiat 500 Turbo features sport-styled seating, sport-designed leather-wrapped shift knob and steering wheel accented with Argento (silver) stitching, and a Grigio/Nero (gray/black) seating and also with available heated leather seating. The 2013 SRT Viper and SRT Viper GTS with all-new carbon-fiber and aluminum skin will house an all-aluminum, mid-front, 640 horsepower 8.4-liter V-10 engine when they return to the market in fourth quarter of this year. Standard safety features include electronic multistage stability control, traction control and new 4-channel anti-lock brake system (ABS). So we are getting affordable (FIAT) and high end (Dodge Viper) performance vehicles from the Chrysler family. Jaguar announced that its 2013 model year XJ and XF sedans will now have Instinctive All Wheel Drive™ powered by a new supercharged 340 horsepower DOHC 3-liter V6 engine with an active torque-management system that uses a performance-oriented rear-drive bias which can shift power to the front wheels to either pre-empt or counter wheel slip. In addition to the Instinctive All Wheel Drive™ and supercharged 340horsepower V6 engines for the XF and XJ, Jaguar introduces a turbocharged 240 horsepower four cylinder engine available in the XF, eight Speed ZF® Automatic Transmissions on all XF and XJ models and Auto Engine Start/Stop on select XF and XJ models. Jaguar made the entry level all wheel drive 2.5 and 3.0 X-type sedan with all wheel drive from 2001 to 2009. With Audi's quattro® success and all wheel drive sedans from BMW, Mercedes-Benz, Lexus, Infiniti and Acura, it was only time before Jag brought AWD back. The 2013 Buick Verano Turbo luxury sedan will be priced at $29,990, including a destination charge of $885 with a turbocharged 250 horsepower Ecotec 2.0L four-cylinder engine with direct injection and continuously variable valve timing and 0-60 mph acceleration of an estimated 6.2 seconds. The EPA-estimated 20/31 mpg ratings is with a six-speed manual transmission available as a no-cost option while fuel economy ratings for the standard six-speed automatic will be announced closer to production. Buick will offer three different models with turbocharged engines and optional six-speed manual transmissions, including the Regal Turbo and Regal GS luxury sport sedans. The 2013 Buick Encore luxury crossover, on sale early next year, will feature a standard turbocharged engine. Verano sales began in late November, 2011 with a 2.4L Ecotec four-cylinder engine and a six-speed automatic transmission and standard voice-activated IntelliLink. For 2013, a rearview camera is standard across all Verano models. The Verano Turbo arrives at dealerships this Fall. The all-new 2013 Mercedes-Benz GL-Class seven passenger SUV will be launched in a new ad, entitled "Many Rogers" with Roger Federer as a "World Class Athlete," "International Celebrity" and "Dad"- is accompanied by his favorite car. 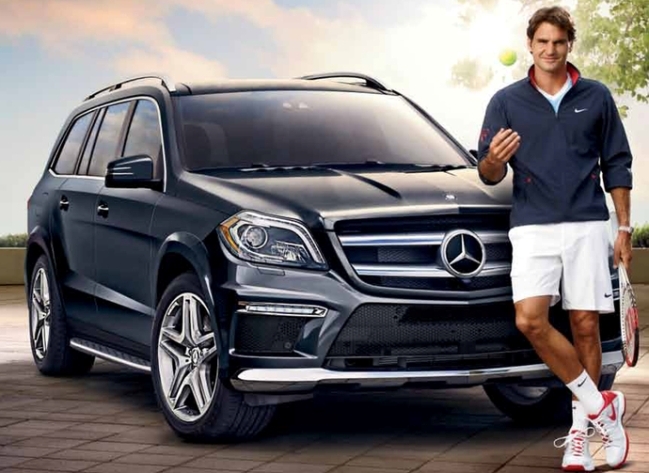 The campaign is being served up in concert with the 2012 US Open, taking place August 27-September 9th in Flushing, New York. The current GL-Class starts at $61,570. The all-new 2013 Mercedes-Benz GL-Class has three rows and three engine choices. In the GL350 BlueTEC, a turbocharged clean diesel V-6 delivers 240 horsepower with 455 lb-ft of torque. Powering the GL450 is a twin-turbo Direct-Injection V-8 with 362 horsepower and 406 lb-ft of torque and in the GL550 429 horsepower and 516 lb-ft of torque mated to a 7-speed automatic transmission. The 2013 GL63 AMG, courtesy of a hand-built, 5.5-liter biturbo AMG engine, delivers 550 horsepower, 560 lb-ft of torque and a top speed electronically capped at 155 mph mated to the AMG SPEEDSHIFT 7-speed automatic transmission, equipped with three selectable driving modes and an automatic double-declutching function for smooth downshifts and also features the fuel-saving ECO Start/Stop function, which switches off the engine at red lights and any other time the GL63 is at standstill. Look for the all-new 2013 Mercedes-Benz GL-Class in dealerships this Fall. The new 2013 Land Rover Range Rover is the fourth generation of the Range Rover developed from the ground up with an all-aluminum unibody structure that is 39 percent lighter than the steel body in the outgoing model making the US specification vehicle with the naturally-aspirated 5-liter V8 will be approximately 700 lbs lighter than the outgoing equivalent. The Range Rover have a choice of V8 engines in the North American market, enhanced by new eight-speed ZF automatic transmissions. There's over 4.7 inches more legroom than the outgoing model so the rear occupants benefit from increased space and comfort. The standard sound system is by British audio specialists Meridian™ and among the innovations featured in the new Range Rover is the next-generation of Land Rover's Terrain Response® system, which analyses the current driving conditions and road surfaces through on-board sensors, and automatically selects the most suitable vehicle settings program for the terrain. The all-new Range Rover will be available in over 160 markets worldwide, with North American customer deliveries scheduled to start in December 2012. More information is coming next month. Yahoo! and Ford, after a two-and-a-half month collaboration on “Plugged In,” a weekly online reality competition show, put up the finale of its ten webisodes this week announcing the winners of the all-new 2012 Focus Electric (or is it a 2013 Focus Electric? The ad branding has both). The webisodes, which covered San Francisco, Washington, DC, Austin, Boston, Chicago, New York, Raleigh, Atlanta, Seattle and Los Angeles, featured two-person teams competing against each other in a series of challenges along with celebrities giving tours of their towns and favorite places - in a Ford Focus Electric, of course. Ford Focus Electric is a five-passenger car that offers the equivalent of 110 miles per gallon (MPGe) city, 99 MPGe highway, and operates entirely on battery-generated power. Focus Electric also has been certified by the U.S. Environmental Protection Agency to offer 105 MPGe combined. By year-end, Focus Electric becomes available in 19 markets across the United States. The question is, will the silliness of these low intellect giggly games played in these webisodes actually help sell cars or even generate credible awareness. Yahoo claims that "with 61 million unique visitors per month who come to Yahoo! to watch video and 21 of the top original online video programs, Yahoo! sets the bar for best-in-class original video programming." Will it sell cars? Or, better yet boost the price of Yahoo stock which is down 5% today or get Ford shares back into double digits? The all-new 2013 Honda Accord Sedan (above) and Accord Coupe (below) are set to go on sale this Fall and the ninth-generation redesigned Accord is critical to Honda as sales so far this year through July are 183,817, trailing the Civic by less than 3,800 year-to-date. In fact, the current model Accord had July sales of 28,639, up 70.2 percent from July 2011 and was Honda's top seller last month. More info on the 2013 models coming soon. 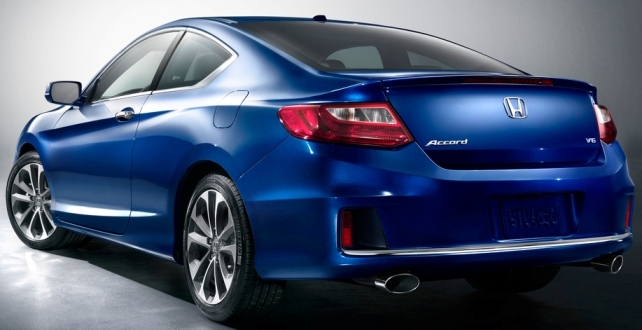 The 2013 Accord will debut new available features, such as Lane Departure Warning, Forward Collision Warning and the Honda-exclusive LaneWatch™ blind spot display. The new Accord also introduces HondaLink™, a cloud-based system that connects you to Bluetooth® Streaming Audio, Pandora® internet radio SMS text message function and all your favorite digital content without hassling with your mobile phone. The available Aha™ feature on HondaLink gives you access to personalized restaurant searches, Facebook audio feeds, audiobooks and more via the audio system interface and voice recognition. The all-new 2013 Ford C-MAX Hybrid, with the combined energy of an electric motor powered by a lithium-ion battery and the 2.0L Atkinson-cycle I-4 gas engine, is now officially EPA-certified at 47 mpg city, 47 mpg highway and 47 mpg combined, the same fuel economy whether driving cross-country or across the city with a top speed of up to 62 mph in EV mode. The gas engine and the electric motor work together to deliver maximum horsepower with the engine kicking in extra power when needed, such as when passing or merging to provide the main source of power. SmartGauge® with EcoGuide helps the driver get better fuel efficiency by providing growing green leaves in the gauge cluster as a reward for economical driving and ECO Cruise, assists in optimizing powertrain elements for economical highway travel. 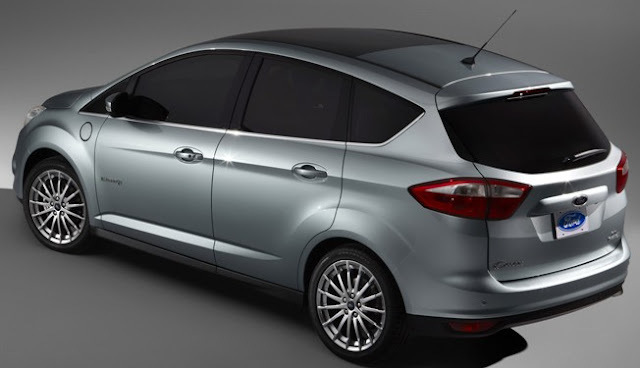 The Ford C-MAX Hybrid has a base price of $25,995, including destination and delivery and is currently available for order at select dealerships. Ford brags that the C-Max is rated at 7 mpg better than the Toyota Prius for $1,300 less. The all-new C-MAX Energi Plug-in is hybrid plus combining a high-voltage lithium-ion battery and electric motor with a gasoline engine. The C-MAX Energi has a button that lets you switch between EV Now, Auto EV and EV Later so you can choose which mode to drive in electric only, gasoline only, or a combination of gas and electric. The plug-in capability allows you to fully charge easily in under three hours using a 240-volt charging station, or overnight using a standard 120-volt outlet.The Energi starts at $33,745 including $795 destination charge. Nissan showed off the production version of the all-new 2013 Pathfinder SUV which is 500 pounds lighter than the outgoing model with a 260 horsepower 3.5-liter DOHC V6 engine that delivers up to 26 miles per gallon on the highway and features a towing capacity of 5000 pounds and an Around View™ Monitor. The all-new Pathfinder has the EZ Flex Seating System™ with LATCH AND GLIDE™ with a 2nd row tip-up seat for use with a child safety seat, which also provides easy access to the 3rd row while keeping the child seat securely fastened. 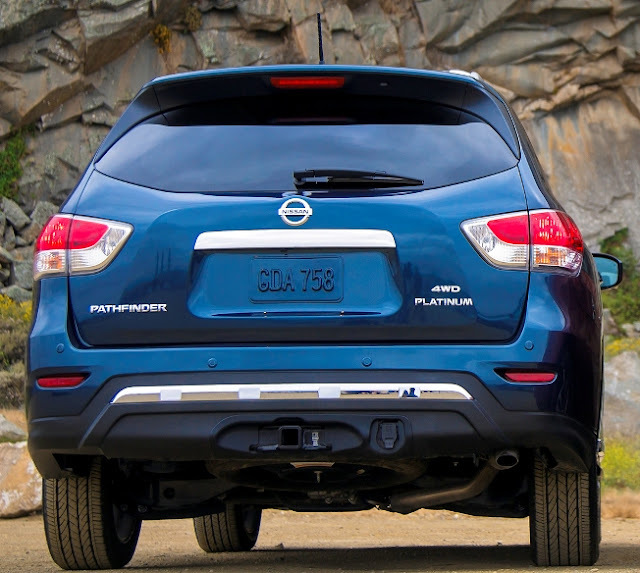 The 2013 Nissan Pathfinder will be offered in 4x4 and 4x2 drive configurations and in four models – S, SV, SL and Platinum (above) and goes on sale nationwide this fall. General Motors reported July U.S. sales of 201,237 vehicles, down 6 percent compared with a year ago. Sales to retail customers declined 3 percent. Sales to rental fleet customers declined 41 percent, in line with the company’s previous guidance. Year-to-date sales of 1,516,950, is a 2.7 gain over 2011. Ford Motor Company's July U.S. sales totaled 173,966, a 3.8 percent decline due to lower fleet sales while July retail sales grew 2 percent compared with last year. Year-to-date, Ford sales are 1,317,589, a 5.1 percent gain over 2011. Toyota Motor Sales, U.S.A. reported July sales of 164,898, up 26.1 percent on an unadjusted raw volume basis. Year-to-date, Toyota sales are 1,210,994, a 28.3 percent gain over the first 7 months of 2011. Chrysler Group reported U.S. sales of 126,089, a 13 percent increase compared with sales in July 2011 and the group's best July sales since 2007. Year-to-date sales of 960,157 is a 28 percent increase over 2011. American Honda reported July 2012 U.S. sales of 116,944, an increase of 45.3 percent compared with July 2011. The Honda Division posted July 2012 sales of 104,119, an increase of 46.4 percent compared with July 2011. 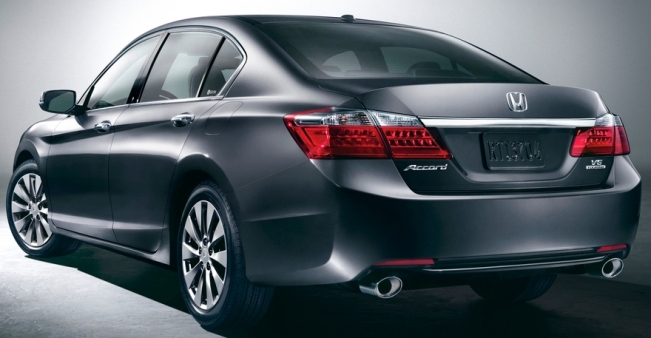 Acura’s U.S. July sales of 12,825 increased 36.4 percent compared with July 2011. Year-to-date sales are 817,926, an 18.9 percent increase over last year. Nissan North America reported July U.S. sales of 98,341, up 16.2 percent. Nissan Division sales increased 12.3 percent for the month at 86,722 while sales of Infiniti vehicles were up 56.8 percent over the prior year, to 11,619. Year-to-date sales of 676,062 is a 14.7 percent increase of 2011. Hyundai Motor America announced an all-time July sales record of 62,021 units, up four percent over last year's all-time July record and up 9.5 percent, year-to-date with sales of 418,690. Kia Motors America had its best-ever July sales of 48,074, a 5.6-percent increase over the same period last year. KMA's year-to-date sales are 336,781, up 15.9 percent over 2011. Volkswagen of America reported July sales of 37,014, a 27.3 percent increase over prior year sales for the best July since 1973. Year-to-date VW sales are 245,739, a 34.1 percent increase. Separately, Audi established a new July record, with sales of 11,707, a 28 percent increase above the old mark set in July 2011. Audi sales of 76,865, up 18.2 percent for the first seven months of 2012 set a year-to-date record, as well. The BMW Group in the U.S. (BMW and MINI combined) reported July sales of 27,152 vehicles, an increase of 4 percent from the 26,120 vehicles sold in the same month a year ago. Year-to-date, BMW Group is up 9.5 percent on sales of 185,715 in the first seven months of 2012 compared to 169,641 in the same period in 2011. Subaru of America reported record sales for the month of July of 25,183 vehicles, a 16 percent increase over July 2011 with year-to-date sales of 189,487, a 23 percent increase over prior year. Mazda North American Operations reported July U.S. sales of 19,318 vehicles, decrease of 7 percent versus last year. Year-to-date sales through July are 163,115, up 13.9 percent. Mitsubishi Motors North America reported July 2012 sales of 4,194 units, down 47.4 percent compared to July 2011. Porsche Cars North America announced July 2012 sales of 2,803 vehicles, an increase of one percent. For the year, Porsche has sold 19,253 cars in the U.S., a five percent increase over last year.